HOLY Week is one of my favorite parts of the year as far as church goes. I’ve spent the Lenten season in a Latin American country before and was looking forward to the new experiences Spain would bring. 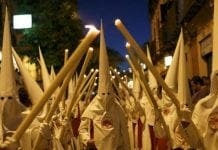 One of the first things that caught my attention was the Klu Klux Klan-esque pointed hat that is the distinctive mark of a Spanish Holy Week procession. After recognizing that this tradition is much older and generally a positive thing, my attention shifted to the true spectacle of the processions – the floats. Some carry scenes of Jesus’ last days but most have images of the Virgin. These statues are dressed in spectacular, luxurious clothes. They spend most of the year in their respective chapel or church in one outfit, and during Lent they are changed into heavier, lusher attire – rich, velvety fabrics in dark, somber colors with intricately embroidered details. These images of Mary are paraded through the streets on heavy, wooden floats carried by a group of men followed by a marching band. The people under the float are all but covered by a thick fabric around the base, leaving only their slowly marching feet to be seen by spectators. The marching band features trumpets and horns in music that plays long into the night. It’s an incredible sight and the processions last for hours – unless it rains. In that case, people stay home and the sound of the rain replaces the solemn music.